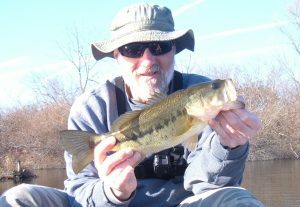 I’ve mentioned more than a few times that one of my annual goals is to land a November bass before calling it quits on the fishing year. And for 2018 I had pretty much conceded that it wasn’t going to happen. I was okay with that as responsibilities, work, weather and some vehicle trouble had conspired against going fishing as we reached the last week of the month. But things worked out after all and I took my shot last Saturday on one of my regular haunts. 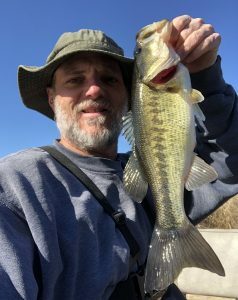 Fishing Factors – Several items got me an unplanned day on the water. First up was the confirmation of open water as observed during a Thursday trip to Galesburg which led to the next item. Thanksgiving Friday off of work then allowed me to get my end of year yard work done on Friday instead of Saturday. A forecast of a Saturday temperature pushing 50F and the job of returning a nephew to Galesburg after an overnight stay were the final straws in the makings of a getaway. 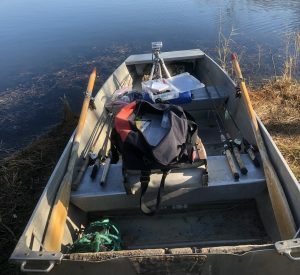 All In – I picked one of my best spots in terms of potential quality bites and past cold water success when it came time to choose a destination. 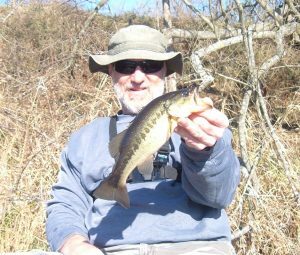 While I normally max out at two or three hours on visits to this lake before hopping to another fishing hole, for this outing I committed to investing all my time and working it over thoroughly. I hit all of my regular areas two or even three times as I picked apart the lake and managed what I felt was a solid creel. 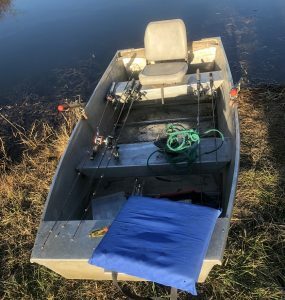 Mission Accomplished – I lost my first bite at boatside as the anti-reverse on my reel gave out causing a batch of slack to spin out as I took my hand off the handle to reach for my catch. Fortunately, I only had to wait about 15 more minutes for another bite to get me on the board. While I’d also hoped to get a boost for my Top 5 it wasn’t meant to be as I could not find anything to boot those two-pounders from the bottom of my list. As a result, it looks like I will fall short of the coveted 20-pound mark for the first time since kicking off the Top 5 project back in 2014. 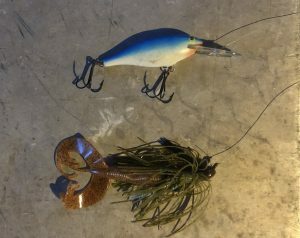 Benching the Black and Blue – I’m pretty much a one trick pony when it comes to fishing a jig and pig being a longtime proponent of black and blue. Well, on this day, I stepped out of my comfort zone for a couple reasons. 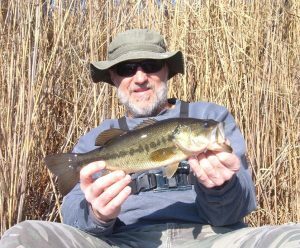 For one, the last time I fished the spot I saw a fellow nail a 5-9 bass on a green pumpkin colored jig and plastic trailer. In addition, I wanted to bulk up and really didn’t have any decent option to replace my normal #11 blue pork rind trailer. The intent of bulking up was that I was hoping that whatever decided to eat it would be bulked up as well. Turned out to be the right decision in terms of bites as it fooled three bass. And while none turned out to be as bulky as I’d hoped, no complaint from me on the successful results.